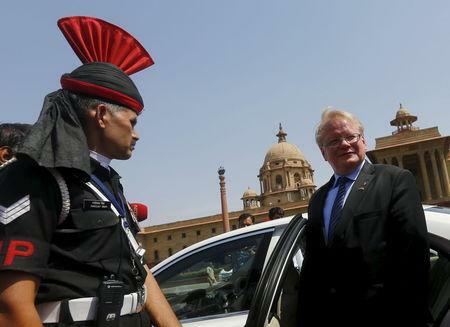 NEW DELHI (Reuters) - India and Sweden were in talks on Wednesday over a bigger role for Swedish firms in India's defence manufacturing, including jet fighters worth billions of dollars, after a deal with French giant Dassault Aviation was scaled back. Sweden's Saab has clawed its way back into the race to equip the Indian Air Force's ageing squadrons after Prime Minister Narendra Modi struck a pact to buy 36 French Rafale planes, instead of 126 originally planned, to cut costs. Saab has offered to produce its single-engine Gripen plane locally under Modi's "Make-in-India" programme, after an earlier version was passed over in favour of the French aircraft. 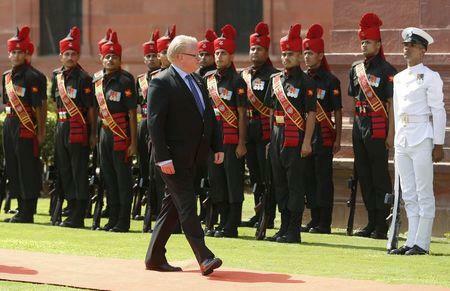 Swedish Defence Minister Peter Hultqvist held talks with Indian government leaders in New Delhi, and was due to meet his counterpart, Manohar Parrikar, later on Wednesday to resume defence supply talks after a gap of four years. With India allowing up to 49 percent foreign participation in the defence sector, Sweden is looking at India as a manufacturing base, Navtej Sarna, Secretary (West) in the foreign ministry, said. An Indian defence ministry official said the Swedes had shown interest in a range of military hardware, not just aircraft, including shipyards in India where the next generation of warships and submarines will be built for the navy. "They are very keen to set up shop here," the official said, asking not to be named in line with defence ministry policy. Saab declined to comment on its offer of fighter planes, saying it would rather wait for India to spell out plans for any potential purchases. Between 2010 to 2014, India was the world's top arms buyer, according to the Stockholm International Peace Research Institute, importing three times more weapons than China to equip a military for a two-front war including Pakistan. As well as France and Sweden, the United States has been active in India, and was one of the top three arms suppliers in recent years in a challenge to Russia's traditional dominance. But Modi has vowed to slash India's dependence on arms imports, saying it weakened its strategic autonomy, and vowed to build a domestic industrial arms base. One reason the Dassault deal faltered was that the French firm and state-run Indian partner Hindustan Aeronautics could not agree on terms under which 108 of the proposed 126 Rafale planes would be manufactured in India. 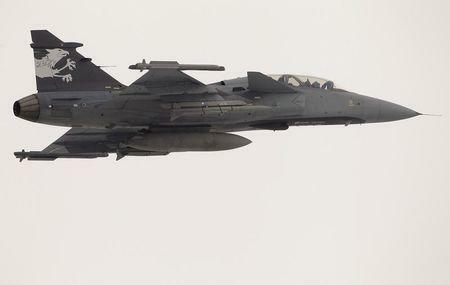 Saab India chairman Lars-Olof Lindgren told Indian military website StratPost last year that the firm had done the ground work to build the Gripen in India. "We already have a Make in India plan for our aircraft," said Lindgren, a former ambassador to India. "We have all the designs for a factory ... how it would look like and how the flow of products would work, and we have also prepared for sub-contractors being in the same area." India's air force says its needs 42 squadrons to face the threat from nuclear rivals Pakistan and China, but because of years of delays and budget constraints, it is currently down to 34 squadrons, each of around 18 aircraft. The main reason is that an indigenous light combat aircraft (LCA) meant to form the backbone of the air force is nowhere near completion, 32 years after it was proposed. Saab has offered to help in the development of the newer version of the LCA, which the Modi government says remains the top long-term priority for the air force. Defence Minister Parrikar told parliament in March that the LCA's parameters were better than foreign competitors in terms of thrust and speed. The one aircraft that scored better was the Swedish Gripen, he said, although it costs much more. "There is no way the government can ditch the LCA, it will be political suicide," said retired air vice marshal Manmohan Bahadur. "They could, however, look for supporting it (from external sources), the avionics etc."